Prima Hydro Seal is a revolutionary new sealant that is applied to a wet surface. That's right, to get the brilliant, organic shine you apply Hydro Seal to lightly misted paint with a damp applicator. You simply wipe it on, watch as it flash dries and immediately remove any residue. In most cases it disappears as you wipe it on. Hydro Seal leaves the paint feeling buttery soft and very slippery. It beads water with fierce intensity. Through our testing, it was literally beading the soap as we were washing panels. Durability is a solid six months on a daily driver. And if easy application wasn't enough, Prima Hydro Seal will not stain exterior trim! It gets better...It actually dresses trim. Yep, it leaves a light luster while covering up waxing mistakes of the past. Hydro Seal is safe on all paint types, glass and black plastic trim. APPLICATION GUIDELINES: Do not pre-wash with Prima Mystique or any other autowash enhanced with polymers. Possible streaking is the result. However, Mystique is ok to use once Hydro Seal has been applied to the paint. 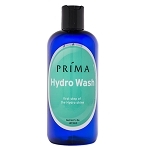 For best results, pre-wash with Prima Hydro Wash.
You will need two medium plush microfiber towels and a spray bottle of water. Fine mist works best. 1. Wash and dry your vehicle normally. 2. Fold your towel into fourths and make wet. Wring out excess water, but leave the towel damp. You should be able to release only a few drops from a strong squeeze. 3. Apply a thick squiggly stream of Hydro Seal to the wet, folded towel. Total volume should equal about a quarter-sized dollop. 4. Smoosh it around on your towel. 5. Mist a 2'x2' section with water. As you get more comfortable with the application technique, feel free to expand your working area. 6. Apply Hydro Seal to the wet section and work it in until it seems to disappear. If it flashes and seems to disappear, you have your moisture correct. 7. Immediately wipe any residue with your dry microfiber towel. 8. Move on to the next section until the vehicle is complete. Like most polymers, Hydro Seal will cure for 24 hours. Although you shouldn't wash, you can certainly apply additional layers of Hydro Seal. 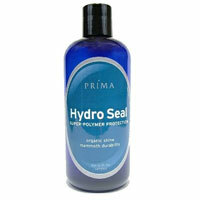 Original Hydro is also safe to use over Hydro Seal.